In retrospect, even if I had a tissue for every one of the 33 veils or bowties that entered the Church, it still would not have been enough to soak the tears I very embarrassingly shed on Sunday morning. But, when God strikes the heart with waterfalls of undeniable grace and gratitude, its difficult to anticipate its timing, or choose flood-proof cosmetics accordingly. One by one they stepped up to our priest and received the Body of Christ for the first time. With a front row seat, my emotions at seeing their faces got carried away at the first “Amen.” In an attempt not to scare their parents at what Jim referred to as “weird, scary, creepy, that’s so weird. Or I guess maybe you have the spiritual gift of tears?” I tried to hide my face in praying hands. When that failed to end the waterworks I attempted mental distraction about what I wanted to eat afterwards (Donuts). I closed my eyes and not discretely placed my forearm close to my nose to try and catch the snot produced when there is too much crying. The ante was then upped by God or the music director or whomever decided the “Hail Mary” song I sing to each of my kids before bed would be the best next song to make Regina continue to whimper. I tried later to be a good mom and blame it on my pregnancy hormones. The truth though, is that the faith of a child is unmatched. They meant those ‘Amens’ and they worked hard to receive that Sacrament. They smiled as big as they could because they knew they had done something BIG. It was not a routine, or part of a Sunday morning checklist. It was exciting and fresh and stunningly beautiful, and my prayer for the rest of my life is that I can receive with the same eager earnestness as each one of those children. Since early September, I met with each of these First Communicants every Tuesday for 90 minutes. Each week they had me biting my cheeks to prevent my laughing at their most sincere prayers for the dead roadkill they spotted 6 days prior while walking their also prayed for dog, their grandma’s pet turtle that lives in a far away land called North Carolina, or the barely scratched knee scrape that they insisted almost sent them to the ER. In other moments, their continuous prayers for their mother’s safe flight, ease at work, or prayer of thanksgiving for time spent with their father edified and strengthened the most tired parts of my motherhood. Their questions and curiosity about Catholicism challenged me and made me and my faith better. And their insistance the Blessed Mother surely wears high heels in heaven and that Jesus is obviously a Pirate fan makes me wonder if imagination is a virtue that Aristotle missed when writing the Nicomachean Ethics. Thank you, dear students, for your innocent faces that brought me to my knees in thankful wonder toward a God who permitted me to encounter your first experience with the Eucharist. You declared on your first taste of the host that it is “WORSE THAN BROCCOLI AND ASPARAGUS! !” and explained to me that Easter Sunday is the day the “Parasites (pharisees) got burned!” and asked me “so when do we get money?” after making your first reconciliation, and wondered if maybe “instead of talking about God we could drink homemade hot chocolate and paint our nails?” In response to the revelation of my pregnancy you said, “I knew your stomach had changed,” and when I told you my age you said, “oh my gosh.” Your spirits are young and pure and you truly want to give God everything. Though my time as your teacher is a glimmer of your faith journey, the opportunity to participate in your formation will forever be cherished, and my gratitude for you eternal. 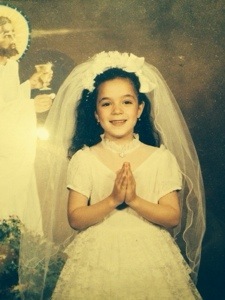 Thats just me on my First Communion with a veil big enough for everyone to share. This is a beautiful and inspiring post, Regina! Thanks for sharing! God bless you, your family, and your students! I’ve teared up at the past couple First Communion Masses I’ve been to… and I don’t teach the kids. It’s all just so beautiful and innocent and I wish I could receive for the first time every time. Also, I cry much more easily since becoming a mom, so there’s that, too. Seriously what is up with momotions!!! My husband makes fun of me so much Bc I deserve it! I just read this post aloud to my fiance and we couldn’t stop laughing through the first couple paragraphs! And I think crying is absolutely justified at such a beautiful moment. I still remember my First Communion. We read a book on St. Imelda, and ever since then I still think of St. Imelda and her close relationship to Jesus in the Eucharist!